Oh, Florida. What are we going to do with you? One day, it’s a meth lab in the Walmart parking lot. 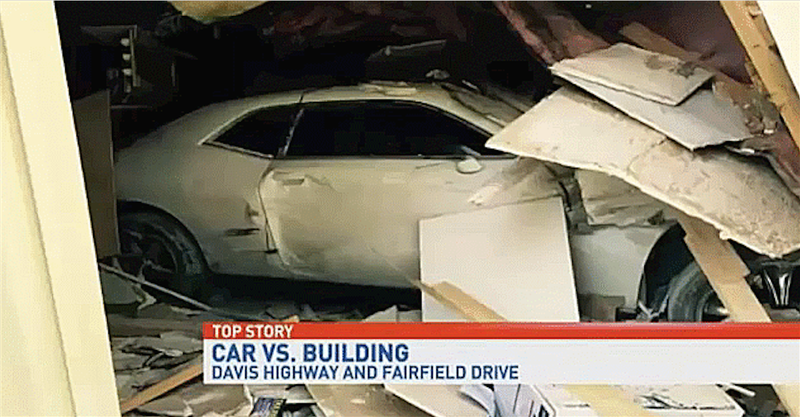 Another, it’s traveling through “time” (read: walls) with a Dodge Challenger. While an attempt at time travel sounds like the weirdest part of this car crash from last Sunday, it isn’t. It’s that the guy—whose identity isn’t released—was too lazy to go build a time machine, so he settled on using a car for his attempt. Hey, man, aren’t you going to stick out just a bit in that modern-day Dodge when you land in the year 1840 or 3050 or whenever you’re going for? The best part of the video report is perhaps an accident in the editing lab, when the footage cuts to the response of a general manager whose office fell victim to the car. After the “trying to time travel” bomb drops, a clip of the man dropping his jaw interrupts rolling images of wreck footage for just a fraction of a second. The magic time-traveling man did end up in a local hospital—the 2015 version of it, which is probably good from a healthcare point of view—after his journey, and police issued a citation for reckless driving. No word on whether authorities will use his expertise to help develop future time-bending technologies. Regardless, we can only hope that law enforcement in Florida receives higher pay than anywhere else. Seriously. They deserve it.